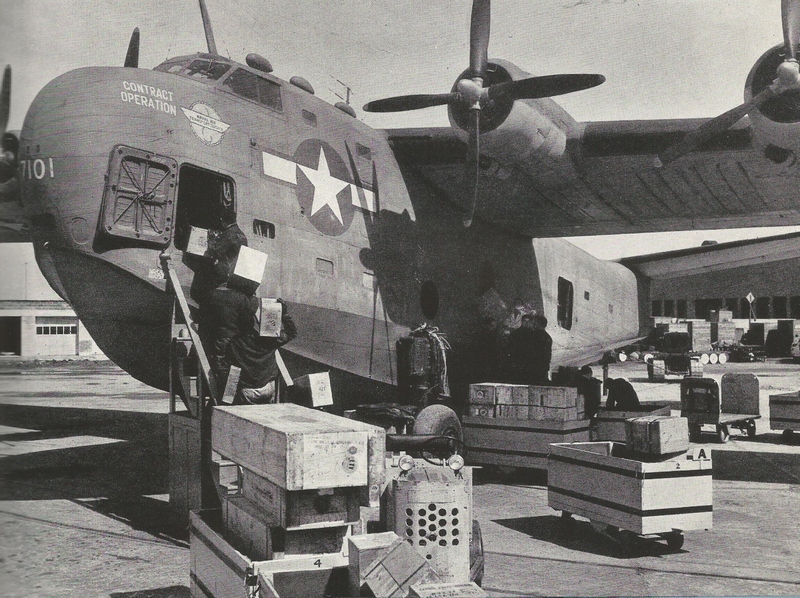 Pan American World Airways has always been associated with passenger service, however what is often overlooked is the fact that Pan American was a leader in air cargo and was, in fact, a pioneer in all-cargo flight operations. Below is illustrated a 1948 advertisement for Clipper Cargo and a page from the 1948 Annual Report showing cargo loading operations on Pan American’s two all-cargo-type aircraft, the DC-4 and C-46. A caption on this page notes that it is cheaper to ship a private aircraft than to fly it to its destination. The the schedules of all-cargo flights did not appear in any of Pan American’s timetables issued prior to 1950 reviewed for this article. South American all-cargo flight schedules appeared in a 1950 timetable using C-46 aircraft. In a 1952 timetable, the South American flights included the DC-4 as well as the DC-6A. All-cargo flights in other parts of Pan American’s system did not appear in these two timetables. In a 1956 timetable, transatlantic all-cargo flights were included as well as South American, with the former using DC-4 and DC-6A equipment. In a 1959 timetable, the DC-6A was used on transatlantic flights and the C-54 (DC-4) used primarily on South American routes (page not shown). Utilization of the DC-7CF on transatlantic all-cargo flights were included in the 1961 timetable. The C-54 (DC-4) was deployed in South American operations. In a 1965 timetable, Boeing 707-321C jet freighters had been introduced into service, primarily on the transatlantic routes. Interestingly enough, the South American all-cargo service included not only jet freighters, but DC-7Cs and DC-6As as well. By 1966, the DC-7CFs had dropped off the timetable leaving just a couple of DC-6As on a handful of flights in South America. This marked the end of the piston all-cargo operations. Going into the 1970s, cargo growth continued. In the 1972 Annual Report, it was noted that new freighter services were introduced to South America and a South Pacific freighter began new operations providing the only service of this type between the West Coast of the united States and Australia/New Zealand. The report also noted that new cargo centers were opened at off-line stations and new cargo terminal facilities opened in Rome, Lisbon, New Delhi, Osaka and New Orleans. New services were also announced for the next year, 1973, including additional freighter between New York and Latin America, New York and Tokyo and across the Atlantic, and new service between New York and Africa. The report also noted that Pan Am “lead the free world in air cargo tonnage”. In 1977, cargo operations continued to grow, carrying more tons of freight and earning more revenue than ever before. It was also announced in the annual report of that year that Pan Am would develop a Five-Year Plan to improve cargo profits by maximizing utilization of passenger aircraft cargo space and increasing the number of 747 freighters in the fleet. The annual report also noted that Pan Am is “one of the world’s largest and most experienced air freight carriers, . . [and] [i]ts fleet of 747 freighters – the largest in the industry – and 707 all-cargo jets, plus the extensive cargo space of its passenger aircraft, give it unmatched capacity. Pan Am’s route system, serving 93 cities in 62 lands, literally covers the world for shippers”. In 1978, cargo volume and revenue set new records and, according to the 1978 Annual Report, Pan Am regained its position as the “world’s number one carrier of scheduled international air cargo. By the end of 1978, the last of the 707s was retired, making the Clipper Cargo fleet all wide-body with six 747 freighters. The fleet evolved from seventeen 707s to the six 747s over the decade and this prompted some scheduling and aircraft utilization changes to maximize the economic potential of the 747. This was done through increasing daily utilization, reducing short-haul segments and increasing available capacity. During this period was the domestic deregulation of the cargo market. This gave Pan American domestic authority in cargo markets, giving the airline new benefits. Thus, for example, adding Chicago to a transcontinental-South Pacific routing would provide additional revenue from the New York-Chicago-San Francisco-Honolulu segments, previously unavailable to Pan American. 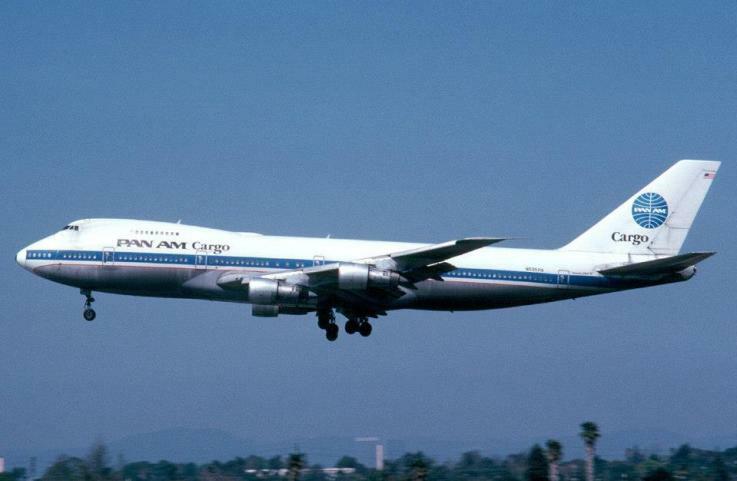 Going into the 1980s, Clipper Cargo remained an important part of Pan American’s operations. Freighter service was restructured to improve profitability by emphasizing high volume markets. 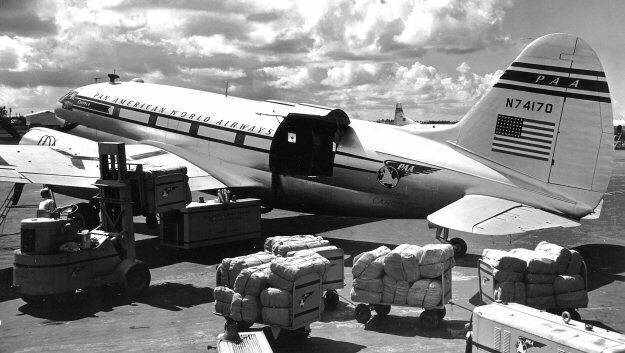 In addition, the control of containers used on wide-body aircraft for the loading of cargo and baggage was computerized through “Pantrac”, Pan American’s world-wide cargo reservations tracking system. This increased the efficiency of tracking containers, maximizing use and reducing the need to invest in new equipment. In addition, taking advantage of the deregulation of cargo operations in the United States and the expansion of domestic services, Pan American took the lead, according to its 1979 Annual Report, in introducing the lowest domestic container rates available. Called the “79ers”, these rates made it possible for domestic shippers to ship by air at rates comparable to “LTL” (less than truckload) truck costs. Also introduced was a service for small packages called the “Clipper Package Service”, offering either expedited airport-to-airport or desk-to-desk service at the option of the customer. Below are timetable pages from 1977 and 1980. Note the extent of world-wide cargo operations in the former. In the latter, the all cargo flights were incorporated into the passenger schedules. From the cargo perspective, things looked quite encouraging for Pan American at the start of the 1980s. But it was not to be. It is difficult to really explain what happened. Perhaps it was the competition from the likes of Federal Express who revolutionized small package service and eventually flexed its wings overseas. Or perhaps it was the fact that Pan American was losing money and needed cash. During that time, the airline began selling any expendable assets it had. Apparently the 747 freighters fell in that category. In any case, Pan American piece-by-piece reduced its all-cargo operation starting in 1982 when then Pan American CEO C. Edward Acker started selling off the Boeing 747 freighter fleet. The last was sold to Japan Airlines in 1983. Thus came to an end, “Clipper Cargo”. hello, firstly is your book still available?it looks great. I have many books etc on Pan Am, my late Dad was a long time panamer.I am a member of Clipper Pioneers, I suppose an avid amateur historian, now that I have more time.